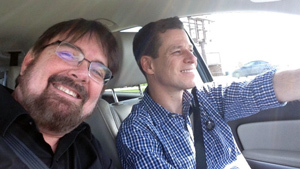 Ken and Kevin Road Trip .com – We have a car. We have a plan. We have a destination. D.C. for a day on less than 9 bucks? Yup. Tom Cruise and Devil’s Tower: The connection revealed! We’re off! Regina, Saskatoon, Edmonon, Banff, Jasper, Calgary … Who knows? How big is God? Ken and Kevin discover the truth in Eastern Georgia.